The Texas Association of School Boards (TASB) has reelected Georgan Reitmeier of Klein ISD to a three-year term on the TASB Board of Directors, representing TASB Region 4, position A. In 2005, Reitmeier became a Klein ISD Board of Trustees member. For more than 30 years, she has been serving this district with our children and community’s best interest at heart. She spent 15 years as a parent volunteer and 15 years as an employee with the Early Childhood Intervention (ECI) Keep Pace program before retiring as the director of the ECI Keep Pace program for the Harris County Department of Education. Reitmeier will chair the Resolutions Committee for TASB for this coming year. Klein ISD Board of Trustees and TASB Board of Directors member, Georgan Reitmeier with Klein ISD Superintendent, Dr. Champion at the annual Veterans Day breakfast at Kleb Intermediate School. 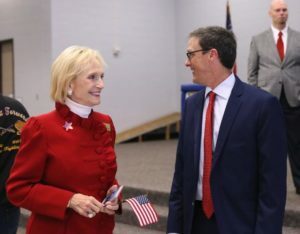 Reitmeier is also the past president of the Gulf Coast Area Association of School Boards and a member of the steering committee for the Go Public Gulf Coast. She is a graduate of Leadership TASB and Master Trustee. As a volunteer, she served as the district coordinator of volunteers and president of two booster clubs at Klein Forest High School. Reitmeier currently volunteers as a mentor at McDougle Elementary. She earned both a master of science and a bachelor of science in education from Oklahoma State University. 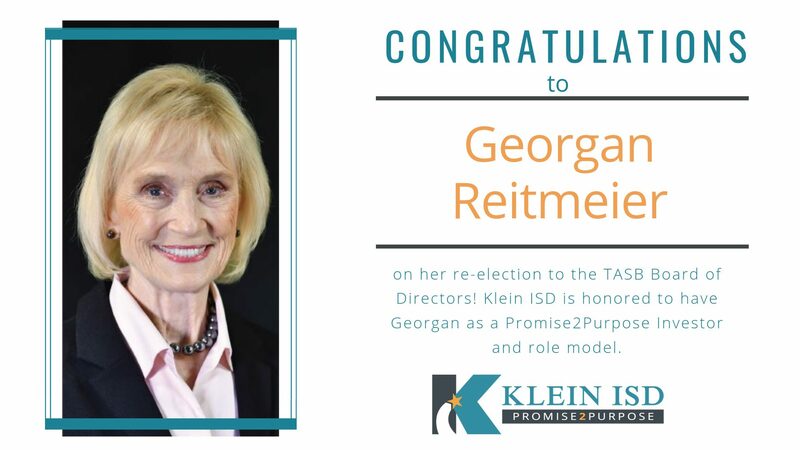 Klein ISD is lucky to have Reitmeier as a Promise2Purpose Investor and we know that the public education system in the State of Texas will continue to benefit from her service.